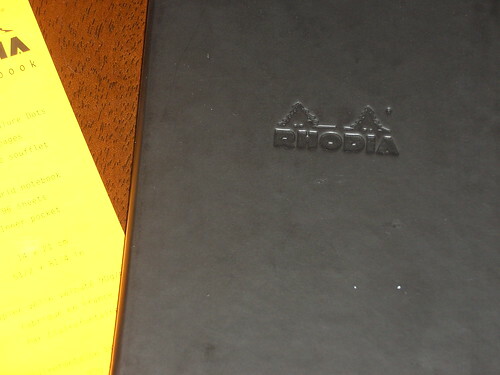 Thanks a lot to my friends over at Exaclair, who sent me out a Rhodia Dot Grid Webnotebook to review. While I have known about the Rhodia brand for almost as long as I have Moleskine, I didn’t take a personal interest at first. The thing that drew me to the Moleskine brand was the subtlety, and Rhodia notebooks and pads were bright, and had branding all over them. 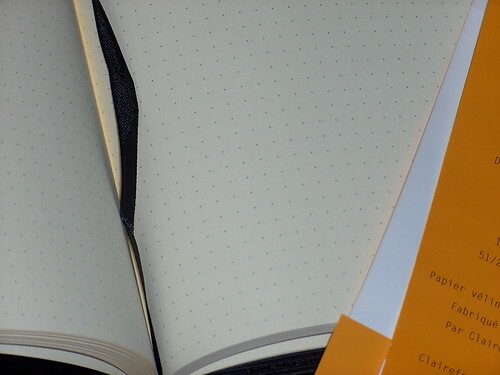 Once I start researching Rhodia, Clairefontaine and the paper used in the notebooks I had to try them… And I wasn’t disappointed! 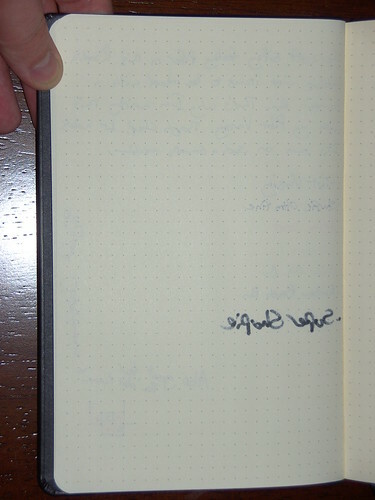 The sample I was sent is an A5 black Dot Grid notebook. I was really keen to try out another ruling type (dots), and to give the “French Milled 90GSM satin paper” a run for it’s money. 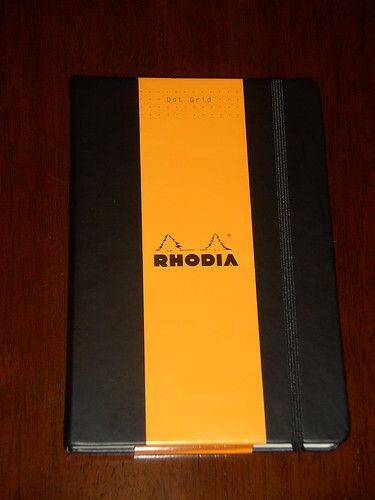 As I said before, I was put off Rhodia mainly because of the branding. I had seen a notebook with the logo on every single page, and to me, it was a bit confronting. I would much prefer to either not have a branding, or something very minimal. This webbie however just has the logo embossed on the front, and nowhere else. The notebook has a hard cover, which feels quite different to anything I have felt on stationery before. It reminds me of leather dashboards in cars. (not a bad thing) The material is marketed as “Italian Leatherette”, however it doesn’t really feel like leather, it’s much smoother, and cushion-y to the touch. I would be worried about it getting damaged if you threw it in a bag with oddly shaped items, but I didn’t test the resilience of the cover. It’s a standard run of features included with the notebook. 96 pages, an elastic closure strap, a material page marker and a back pocket. One thing I did notice was the pocket is easier to use than others I have tried. The biggest attraction to this notebook for me was the paper. 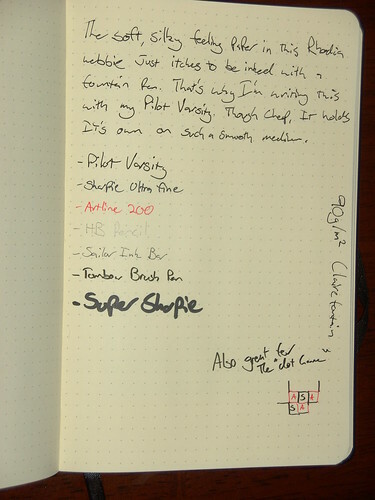 90GSM in a notebook is amazing, and the way it feels… It draws you in and makes you love writing in it. It has a cream colour, which normally you can’t see because it is offset with bright orange, however does stand out against the black. One possible drawback to having a higher grade paper is it makes the notebook thicker. This could be a pain for portability, but if you are going to take an A5 notebook with you, chances are it will be in a bag. The dots are an interesting ruling. You find yourself writing in the lines they make, but as you can see in the writing sample below, they don’t force themselves into view or obscure what you are trying to portray. The writing test didn’t disapoint. Being 90GSM, it’s thick enough not to show through easily, there was no sign of bleeding with my Varsity fountain pen, and the paper brought most of the pens I wrote with to life. Each pen flowed over the paper, leaving a solid reliable line. I am going to enjoy using this notebook, and recommend it to anyone who is looking for something to use with their fountain pens. What it all boils down to is this: The paper really does make a difference. Be warned though. It has many dots.